As I outlined in my coverage of Things' automation features, I'm a heavy user of tags because they let me quickly filter views in the app by different areas of my life. For instance, I use launchers to filter my Writing and Admin tasks, which helps me stay on top of different aspects of my business. 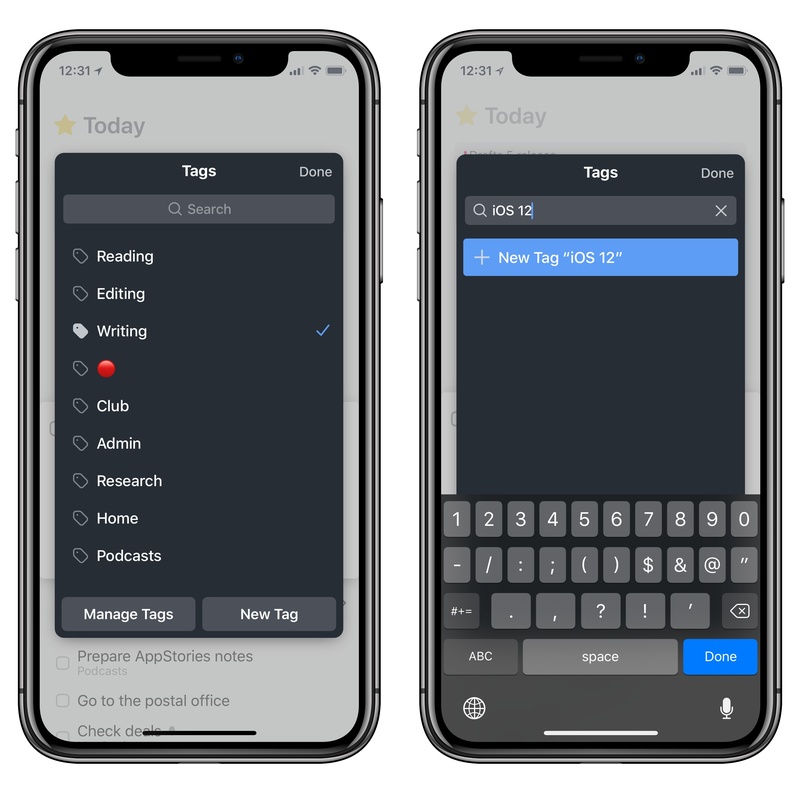 Things 3.5 brings some much needed additions to the iOS app's tagging system. The tag window is now searchable: if you're tagging a task and can't find the tag you're looking for, you can pull down to reveal a search field. You can type into the field to search for existing tags as well as create a new one for the currently selected task. The new tagging screen in Things 3.5. Speaking of tags and search, if you search for tags across the entire app, Things will now show you tags nested under the tag you're searching for, too. If you use tags as a system to "process" your tasks and organize them, Things 3.5 brings back the ability to filter tasks by "No Tag". This option surfaces all tasks that haven't been tagged in one list, so you can act on them right away and file them under the tags they belong to. It took me a while to be sold on the idea of tags when I moved to Things last year (I was never a fan of contexts in OmniFocus and the implementation of labels in Todoist never quite clicked for me), but I'm glad I took a disciplined approach to tagging my tasks in Things. The app makes it easy to filter different screens by tags, which are deeply embedded with the UI rather than feeling like superfluous layers of metadata. Today's improvements are solid refinements to the tagging flow on iOS. If you use a note-taking app (like the excellent Drafts 5, for example) or any other type of list to plan your tasks before adding them to Things, or if you just want a quick way to turn lines of text into multiple todos, you'll be happy to know that Things 3.5 adds the ability to paste text and convert lines to tasks. This sounds like the most obvious feature to have in a task manager, yet so many of them don't integrate with the clipboard as a simple mechanism of importing tasks from other apps. Here's how it works in Things 3.5: once you've copied one or multiple lines of text anywhere on iOS, you can open Things, look for the 'Paste' button under the ⌄ menu in the top right, and hit it to add what's on your clipboard as tasks in the app's current view. As soon as a task is added, it'll be highlighted and you'll feel a subtle haptic tap on compatible iPhone models. Pasting lines of text in Things 3.5, where they are converted to tasks. 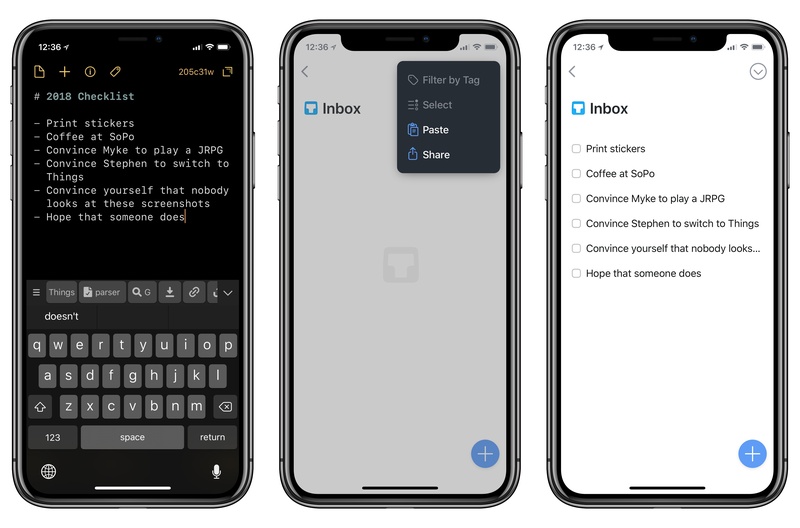 The disarming simplicity of this tweak is most effective, in my opinion, for those scenarios when someone sends you a list of things to do and you don't want to manually convert them one by one to tasks. I run into this with my girlfriend and checklists in the Notes app on a regular basis; Things now offers me a more convenient way to save those lines of text as todos with one tap. 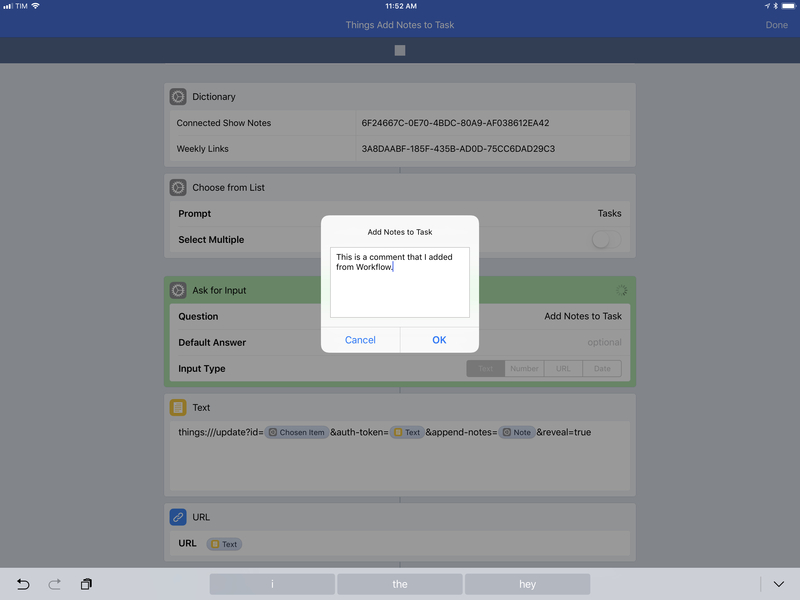 Even better, the feature is also supported for an individual task: if you tap the '+' button to create a new task and paste lines of text into its blank title field, the first line of text will become the task's name, and subsequent ones will be added to the note field. In the future, I'd like Things to gain proper support for importing structured plain text in Markdown or TaskPaper notations and go beyond the mere conversion of lines to tasks. Perhaps there could be ways to turn Markdown sections into headers in a Things project, or maybe the app could differentiate between adding lines of text to the note field and adding checklist items to a task when pasting text. I also look forward to being able to copy tasks from Things and paste them as text into other text editors.1 The document-like nature of Things projects seems well suited for this kind of deeper text integration, and I hope Cultured Code is considering it. One of the features I requested in my original coverage of Things' URL scheme automation has been added in version 3.5: in addition to creating items (both projects and tasks) via URL commands, you can now update existing tasks and projects to alter some of their attributes. As explained by Cultured Code in the app's documentation, the new update command of the URL scheme requires an authentication token as an extra security measure. The token (which you can find in Settings ⇾ General ⇾ Things URLs inside the Things app) prevents other apps or webpages from accidentally launching Things and modifying data without your explicit consent. The only way to obtain the token is to visit the app's settings, manually copy it, and use it in the correct field of the URL command. Requiring an additional authentication token for commands that update or delete user data has become common practice among developers of URL scheme-enabled apps; it's good to see Cultured Code employing the same technique. I'm happy with the work Cultured Code has put into building the update command for Things 3.5. Every attribute of a task or project can be changed via a URL scheme that references the original item through an ID (previously explained here). You can change a task's title, date, and deadline. You can append or prepend notes or checklist items. You can change the list a task belongs to or mark it as a complete. Everything a task in Things supports can be updated via automation. The same is true for projects: you can add tasks, set notes, change the area and deadline, or even duplicate a project before updating it. The set of attributes and actions supported by Things when updating items is comprehensive and easy to approach if you're already familiar with the app's URL scheme. In Club MacStories' Weekly newsletter later this week, I'm going to share a workflow to add checklist items to existing tasks, which are fetched from a database of task IDs stored in iCloud Drive. 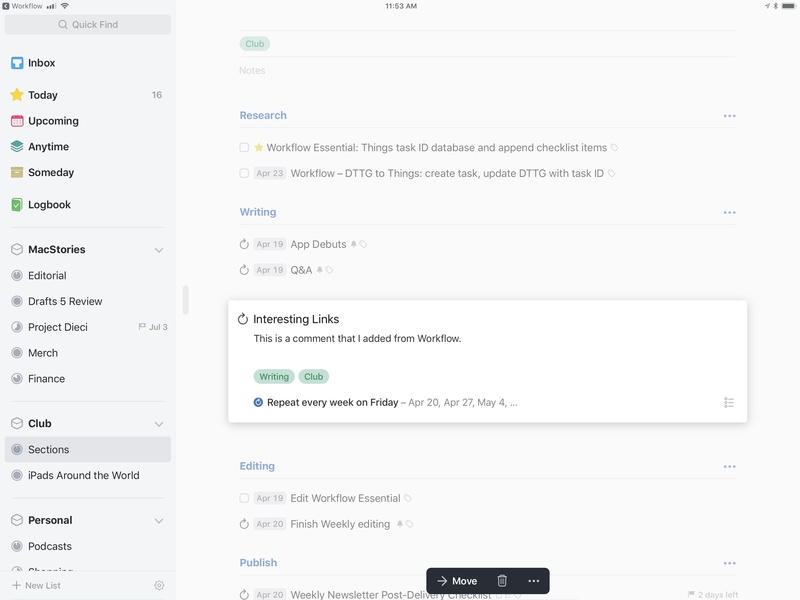 As I will detail in the Workflow Corner section of the newsletter, the workflow will support adding checklists both via manual input as well as from other apps such as Safari. For today's story, I put together a workflow based on the same system but which simply appends notes to an existing task in the app. After asking to pick a task from a list of Things IDs2, the workflow brings up an Ask for Input action where you can type text that will be added to the note field of the chosen task. ...which is added to a task in Things. Areas can be collapsed in the sidebar. If you find the app's sidebar to be too crowded, or if you just want to focus on specific areas from time to time, you can collapse areas to hide projects contained in them and enjoy a cleaner sidebar. A nicer widget. Things' widget has been updated with support for reminder and checklist icons, a moon glyph for This Evening items, and progress pies for projects. It looks cleaner. Links are supported everywhere. 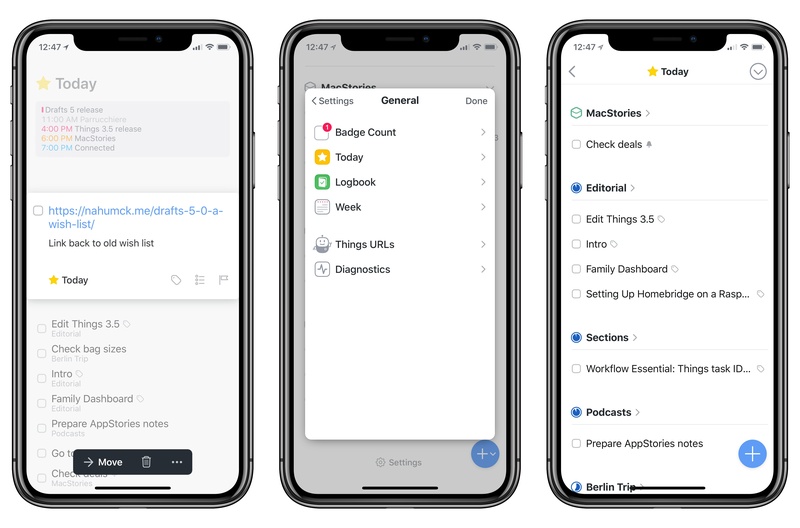 Things 3.5 makes links tappable everywhere: in the title of a task, inside notes, and even within individual checklist items. I'm happy about this change because I save all kinds of links every day and I was always annoyed when Things forced me to manually copy and paste them into Safari's address bar. Links in titles (left), redesigned settings, and the Today view grouped by list. Redesigned settings. The app's settings screen has been redesigned for clarity and easier navigation in the General section. The ability to group items in the Today view by list, previously a hidden setting accessible with a secret gesture, is now an option in Settings ⇾ General ⇾ Today (for the record, I prefer to manually sort my tasks in the Today and This Evening sections). Major Things updates keep coming at a good clip. I'm glad I started using the app last year because I can now appreciate the work Cultured Code is putting into engaging with the community. 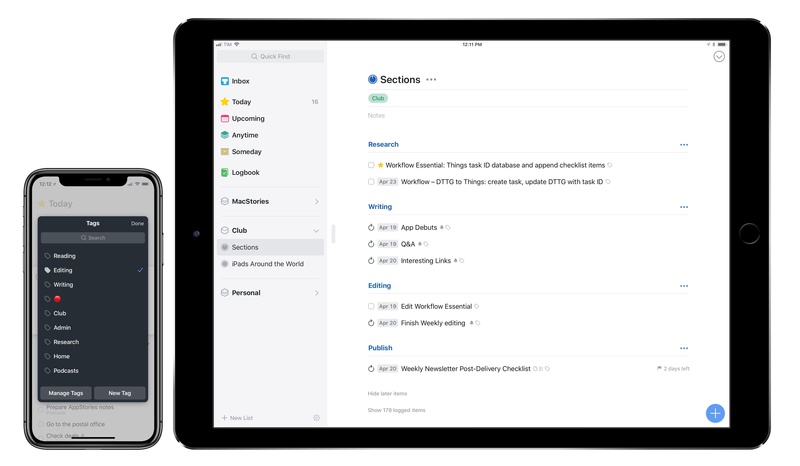 Things 3.5 polishes important aspects of the app such as tagging and clipboard integration, and it continues to expand the range of actions supported by automation and third-party apps. With the "spit and polish" release done, I'm excited to see what Cultured Code will tackle next. Things 3.5 is available on the App Store for iPhone, iPad, and Mac.